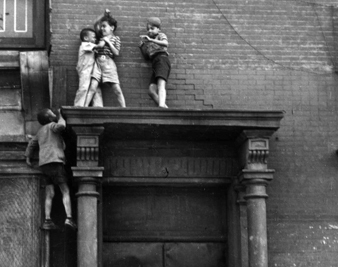 Helen Levitt’s famous photographs of children colonizing the curbs of Harlem and the Lower East Side during World War II–still images saturated with movement, banter and drama–are almost too easy to appreciate. Is it not overly endearing, somehow, that she captured a scrum of little boys in dark overcoats and penciled mustaches waltzing together on an avenue sparsely populated by stately and slender couples off in the distance? Looking at the image, it is hard not to smile. Other photographs, ones that fascinate or disturb more than delight, also engage our very personal interest: you look into these long-departed New Yorkers’ faces, with their instantly readable moods, as if they were your own. Their direct gazes seem to match Levitt’s reluctance to judge them. In almost all of her work, she managed to fix in time unrepeatable encounters on the city’s streets while outrunning the often moralizing limits of the documentary mode–a disinterested way of seeing that could lead to her classification, usually in the penultimate paragraph of chapters on street photography, as a kind of charming footnote complicating both the gravity of Walker Evans and the principled artlessness of Robert Frank and his influential disciples. In her early 20s (having dropped out of high school in 1930, one semester shy of graduating), Levitt frequented the Photo League without becoming a member. Though acquainted with Henri Cartier-Bresson and accustomed to collaborating with Evans and James Agee, she never belonged to a circle that might have pressed her to use the medium to promote a message. If a consistent meaning emerges from her images, it is idiosyncratic, fused with the meaning of her mortal subjects and easy to mistake as being not wholly serious and certainly not cerebral. What her photos showed–even in the early 1940s, when a photographer roaming a hardscrabble town or a desolate city block might be expected to favor scenes of dignity and endurance, in the socially conscious vein of the Farm Security Administration–was how wide a range of human expressiveness could be compressed into small black-and-white snapshots. What Agee perceived in Levitt’s images was a kind of primordial humanity alive in the most fleeting exchanges. Exchange was the locus of her vision: a characteristic Levitt photograph of New York frames an ensemble cast, or at least a lively duo, whose reflecting glances or poses thread the meaning of the image. I’m thinking of the three boys hiding on a stoop with toy guns in hand, scouting for the enemy, the most nervous boy crouched up in a doorway, stealing a glance at the other two below him on the steps, who look eager to make a run for it. The perfect choreography of this shot–each boy’s body aligned along a different axis, and these lines seeming to domino down toward the empty right-hand side of the picture, where danger awaits–is a feat of composition Levitt had learned from Cartier-Bresson, whom she met in 1935 and whose crisp, poetic instincts helped persuade her to take up the camera. (By then she had been apprenticed to a commercial photographer for several years but, so the story goes, hadn’t found a way to push her own aesthetic ambitions further.) What makes this shot typically Levitt is that the composition tells us less about formal perfection, or a “decisive moment,” than what each of these three boys is feeling and who each of them is: the liquid action of the moment seems to flow through the boys poised on the steps but freezes into a lump in the third boy’s throat. In Levitt’s classic photographs, a vision of the responsive, reciprocating nature of the human animal emerges: to say that we are “social beings” seems inadequate after spending time with her people, who don’t just mingle but appear to make companions of anyone caught with them in her frame. They endlessly perplex and console and appreciate one another. Quite often they serve as living mirrors for each other, as in a picture of two older women standing near a stoop, the one throwing back her head with glee, the other just beginning to grin, unsure why, mustering a certain inner generosity. It seems significant that Levitt’s first preserved photograph is of two Gypsy girls with identical jet-black braids and floral-print dresses in Central Park (neither of them quite in focus), moving fluidly in counterpoint to each other, with a boulder rising diagonally between them: the composition has the furling symmetry of a playing card. Levitt was fascinated with how people shared space, and how each person’s individuality bent as it sought out another’s. In the last decade Levitt’s photographs have reappeared in a number of lush hardcovers published by powerHouse: Crosstown in 2001, Here and There in 2004, Slide Show in 2005 and Helen Levitt last year. Looking at these volumes today, one is struck by something else: how many of her New Yorkers (both young and old) are caught in less than adorable poses. It turns out that her abiding interest in playful figures led her not just to waltzing boys but also to boys bent double, adults hunched over, kids fallen in a heap. In one photograph a young fellow thrusts his posterior at the camera while what must be a rubber ball pokes from his back pocket, and nearby a friend (or enemy), also facing away from the camera, crumples on the sidewalk in a fetal position. There’s the menace that coruscates from the iconic image of two boys slithering up a tree in white, triangular bandit masks. There is also the arguably more ambiguous photograph of a parked dark sedan, glossy and regal with its voluptuous 1940s curves, and a blond boy wearing only shorts and shoes jackknifing next to it. He’s hugging himself and we can’t see his face, and a stray piece of cardboard litters the sidewalk a few feet before him. Is he trying to read it? Is he trying to see under the car? Why is he making himself so awkward? In the 1950s Levitt worked as a film editor for Luis Buñuel, and after that caesura–during which, coincidentally, Robert Frank diverted the direction of street photography with his crass, discomposed collection The Americans–she switched to color photography and seemed even more drawn to snapping people bent over, contorted or hanging half out of unattractive cars. Once you notice this minor theme, it becomes easier to see that quite often she sought not the drama of people engaging with each other but the many odd ways they fail to connect, fail even to express themselves within the implied narrative of their own portraits. The several famous photographs of children in masks–the subject and style of the images working in perfect equilibrium against each other, to attract and repel at the same time–seem to fall into this category. Likewise, Levitt’s pictures of solitary individuals (like her snapshots of kids’ chalk drawings) often vibrate with an anxious energy, an impulse that flows directly toward the camera only to deflect our interest. Consider the well-known photograph of a boy wearing a makeshift costume, a cowl of fabric hiding his face. An intriguing element of the show at the Laurence Miller Gallery was a series of first proofs that Levitt didn’t want released in her lifetime–an opportunity for postmortems of her work that the gallery chose not to pass up. These outtakes show her prospecting for the right composition, and they offer slightly lesser alternatives to some of her most famous pictures. In the final print the costumed child stands alone in a doorway, dominating the frame like a withdrawn gatekeeper; in the proofs he was also photographed twice with a companion, a little girl who peekaboos from a shoulder-height screen (in the definitive shot the screen is only partly shown beside the hooded child). What Levitt saw was that cropping the photo down to a single subject forces the viewer to look at the child who is hidden. Our frustrated gaze, seeking human contact and gaining none, fairly hums with alarm. Jana PrikrylJana Prikryl’s first book of poems, The After Party, has just been published. She is a senior editor at The New York Review of Books.